Like most of these blog-hopping things, there are rules which I’ve been asked to pass on, so here they are ……. I’ve been freelancing for 20 years as a trainer and consultant for charities ……. The two little Spanish girls in the house next door thing I’m completely barmy, so they worked it out pretty quickly. So those are my seven, in no particular order. I hope you’ll enjoy hopping over to a few of them – I’m sure you’ll agree with me that they are all highly deserving of the “One Lovely Blog” award! This entry was posted in Uncategorized and tagged Andalucia, Axarquía, Blogs, One Lovely Blog, Spain, SpanishBlog, Tamara Essex by tamaraessex. Bookmark the permalink. As a newbie to blogging I am deeply honoured!!! Our blog is actually a “two man show” – well a woman and a man – my lovely Canadian Co-Director will be taking an equal part and we hope to blog often from the beautiful city of Málaga (although our busy agenda may not make that as often as we would wish)! Gracias!!! 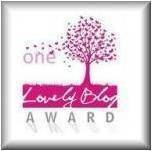 First of all, congratulations on your blog being nominated for The Lovely Blog Award – thoroughly well deserved, Tamara. I have enjoyed reading every one of your posts. I’m honoured that you have nominated “East of Màlaga” to pass the Award onto. It’s always rewarding and encouraging to be nominated by one’s peers. Thank you so much. Thank you so much! I’m extremely touched that you should think of me, especially as I blog somewhat infrequently! Maybe I can change that in this newest of years….Well, I love your blog, and I sincerely hope that you win – assuming it’s a competition – or at least that more people get to read you! Happy 2013: may you be happy, may you be well, may you be free from fear.